World Port Development is an independent publication that strives to offer balanced and informed reporting, providing a complete overview for all concerned. We talk to manufacturers, operators, port staff and customers to present the whole picture, not a one-sided argument. In tune with our readership, and their concerns, World Port Development acknowledges their needs and interests, and our editorial staff report with a vigour and enthusiasm that distinguishes us from unchallenging magazines that report ABOUT ports and terminals. We place ourselves on the industry frontline, and report from within the maritime sector FOR ports and terminals. Bright, attractive and uncluttered, every page is eye-catching and easy to follow, stylishly avoiding drab monotony with a colour-coded, easy to reference, layout. Each month we lead with a broad news section, keeping you abreast with the latest developments, reporting on political, competitive and regulatory trends within the industry. 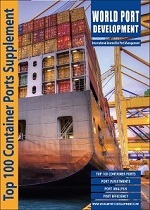 We also include regular pull-out supplements for future reference, as well as port and industry surveys. Global in every way, World Port Development regularly features as the official magazine at selective key exhibitions and conferences worldwide. World Port Development has one agenda, and that is to work with the industry to create the most accessible, relevant journal available. We are proud to be the most exciting and progressive publication on the market.